Creativity comes and goes like the waves of the sea. There have been times when mine has completely disappeared from the horizon. Thankfully, it was a temporary thing. Experience has taught me to always be prepared, ready for it to strike when I least expect it. Often I stop my busy day to jot down my ‘moments’ of creativity in my nearly full e-notepad. I know there are other creative souls out there doing the same. What do you do to keep your creative juices flowing? I try to mix it up. A certain amount of unknown factors participate, so spontaneity is a big part of my program for creativity. I love to gaze upon a ‘new’ landscape from time to time to jolt the juices. I happen to be married to a creative soul, who affords me this opportunity often. We jump into the car and motor to another town on the other side of the Blue Ridge Mountains, and we feast upon the ‘new’ landscape. We often choose a town we have been to before, and we always see something ‘new’ in the landscape. We love the older towns or villages which have kept the landscape solid in the old structures. Those with an old train depot or old court house are among our favorites. Then there are the villages which thrive on tourism. Those are more commercialized, but we still find something to enjoy about them when we visit. I used to spend hours drawing perspective city-scapes during my high school drawing classes. I am not a lover of big cities, but the street scenes do lend a nice view for perspective drawing. 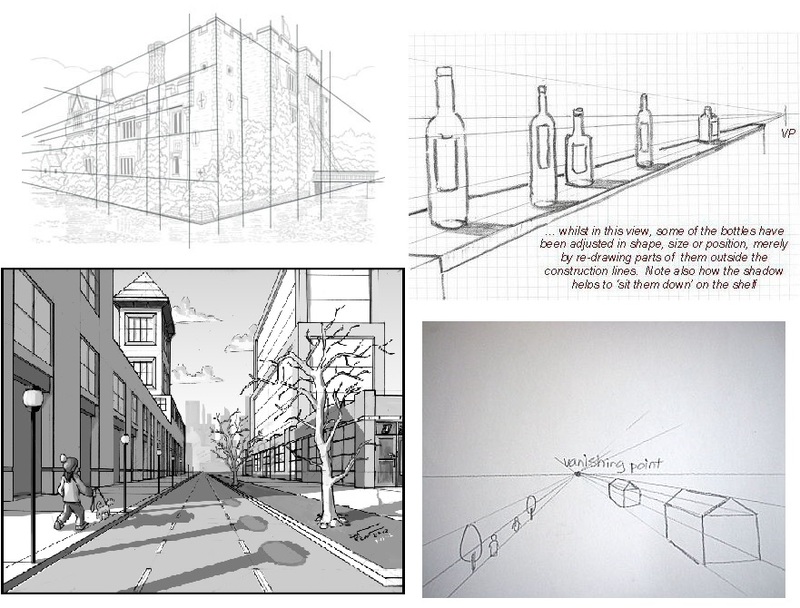 If you have taken any art classes you know what I mean by perspective drawing. Laying out the horizon–the point where the buildings and activities we witness all disappear, and identifying the point where light enters the landscape. With those two elements, we can create whatever town or village we choose. We can even repeat the drawing from a different vantage point with our light source entering from another angle, thus creating an entirely new perspective. Today, when I gaze upon a quaint little cobblestone sidewalk off a small town square, no matter where it is in the world, I am reminded of those days. The days when I first realized that my perspective is my very own. I can share it or keep it to myself, its up to me. I also know that others may not agree with it, but that is okay too–it is mine.